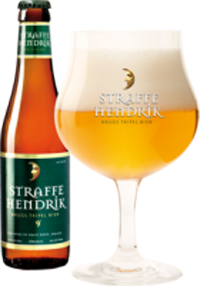 Straffe Hendrik is a powerful beer with rich flavours of malt and hop for beer connoisseur. The Straffe Hendrik family consist of a golden tripel, a brown quadrupel and the limited editions of Heritage and Wild. All beers have a high alcohol percentage and are rich in flavours and taste. They are strongly hopped and brewed with a subtle mixture of different kinds of malt of the highest quality. The taste of the beers evolves as the years go by. In 1981 the city of Bruges revealed a work of art to honor the patron saint of the brewers. The mayor had a special assignment for brewer Henri Maes IV and his daughter Véronique, to brew a new beer to serve at the inauguration of the statue of Saint Arnold. The beer was highly appreciated and soon became an established product in the brewery. 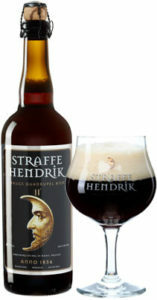 The name Straffe Hendrik translates as Strong Henri and was chosen because of the numerous strong Hendris in the family. In 2008 Xavier Vanneste was able to bring the lost son back home. 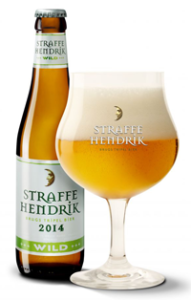 Today Straffe Hendrik is the last authentic triple beer brewed in the city of Bruges. Straffe Hendrik Tripel is a golden triple with a sturdy white collar. The aroma is spicy with hints of black pepper, coriander and ginger, and is even insinuating the presence of oranges. The beer is brewed with a selection of Saaz and Styrian hops of a very high quality. The subtle blend of six special varieties of malt gives the beer a well-balanced and powerful taste. The palate initiates a hint of caramel, soon flowing into certain bitterness. In the finish one can discover citrus fruits and even subtle flavours of banana. The triple has an alcohol percentage of 9° and the refermentatation in the bottle generates a long natural shelf life. Launched in 2010, Straffe Hendrik Quadrupel is an intense beer, dark in colour and full in taste. The aroma is elegant, spicy and slightly roasted. The sophisticated blend of special kinds of malt give the beer a complex character, combining a delicate dryness with hints of coriander, dark fruits, anise and roasted chestnuts. The palate finishes in a syrupy taste. The refermentation in the bottle creates a living beer that will evolve over the years. Straffe Hendrik Wild is a wild version of the famous Straffe Hendrik Tripel. The tradional tripel beer is refermented with a wild Brettanomyces yeast, that creates unusual fruity aromas in harmony with the rich use of aromatic hop varieties. The wild yeasts also provide a longer natural shelf life to the beer and taste developing over the years. The beer needs a longer maturing period in the bottle before it can be released and therefore first matures in the bottle for three months in the cellars of the brewery. The refermentation with wild yeast is only finished after three months and the young beer is palatable. The beer will continue developing in the subsequent years. The bitter hop aromas will become softer, whereas the wild Brettanomyces yeasts will continue working and creating hints of fruit, flowers and wine. 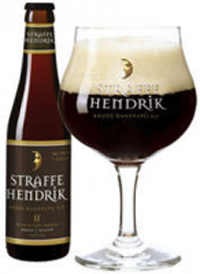 Straffe Hendrik Heritage is a special version of the well- known Straffe Hendrik Quadruple. The dark and heavy beer is allowed to mature for more than a year in different varieties of oak casks in the brewery’s cellars, which date back to the Middle Ages. This gives the beer a more complex taste. The tannins form a harmonious unity with the rich flavours of the special malts. 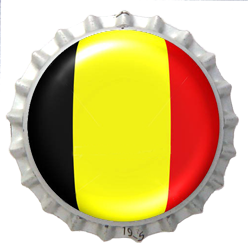 It is a beer that can be kept for several years, during which time the taste will further evolve in the bottle. As it gets older, a hint of port or Madeira wine will become more evident. Food Pairings: Digestive after a great dish.